Here are the FlashTrac Release Notes. You can view our most current feature updates, as well as see past release notes in our archiving section. Blue Sky Board – Added the functionality to search by destination country without warehouse role restriction. Including this will assist in monitoring of orders coming into a specific international country. Added/fixed functionality relating to address character limit, which would truncate the address lines when passed to Precision. 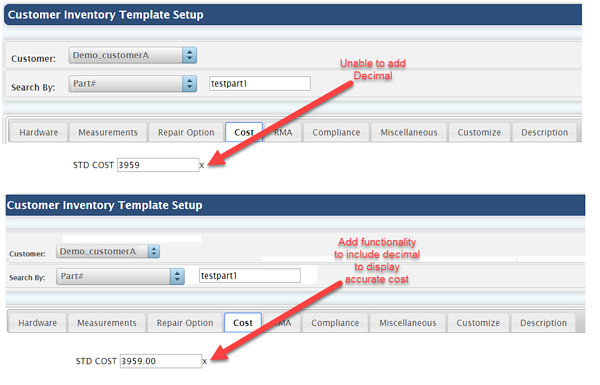 Fixed functionality to update accurate STD Cost by decimal in the individual inventory template setup. The value could only accept full numbers preventing the ability to properly update. Agent Audit Report - Updated how Audit Days are calculated; updated the labels "Posted to Dynamics" and "Ready for Dynamics Posting" to read "Posted to Navision" and "Ready for Navision Posting"; and updated the export document to pull in new calculation. Fixed SQL Injection, which was preventing single quotes being added across all text fields within the Agent Main. Updated the Warehouse Changes screen, updating the name to Warehouse Changes and removing unneeded steps. 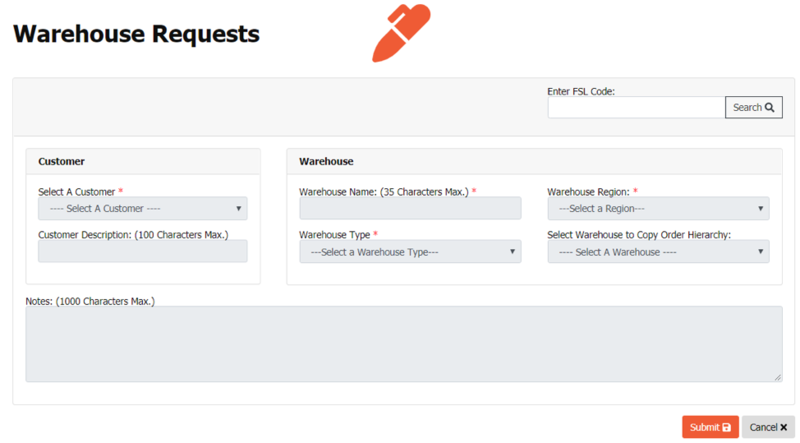 Revamped the look and feel of the Pending Warehouse Request screens for easier navigation and seamless approvals. Blue Sky Dashboard will now display orders shipping internationally to the U.S. instead of displaying only orders from the U.S. to international destinations. We’ve rearranged our contact Agent Data page within our Order Update screen, which will improve the communication gap between our global command centers and partners. Included additional shipping document types within the Order Update screen. When uploading non-compliance documents to an order, this will ensure the appropriate document type is associated correctly. Added the ability to delete Cycle Count Documents without the need to submit an IT Service Desk ticket. Consolidated and improved the look and feel of the Agent Billing Invoice Status screen to view all Partner invoices under one screen, included a data range, and the ability to view completed invoices. Added approval prompt to Agent Billing, to notify Finance when additional charges are being requested to be paid. Added a new line charge called Transportation to both Customer and Agent Inbound Pricing Schemes. Updated search criteria to be based on Date Approved. This streamlines researching invoices within the Rental Navision Report. Updated IOR/EOR Report to populate the Total GL Sum without performing manual additions. Fixed backend stored procedures to allow variable data sizes to match tables sizes when using the Multiple Orders Tool. Created backend user log to determine when a customer address has been created or updated in the address book. Fixed the ability to upload shipping (non-compliance) documents even if a customer is enrolled in our export management services. Fixed the ability to denote which lines (parts) have completed the WIP Process. Fixed visibility on Precision Error Log to display customer and orders based on user permissions. Fixed the load time to render results for 90 days for Agent Rental Review Report. Fixed minor grid alignments on the Rating Screen. Removed the notes tab FlashView from Order Update. Fixed an issue where Precision CCH holds were getting removed prior to the task being completed. Fixed the Multiple Order Entry screen - when uploading a document to create an order, it now ignores skipped lines not filled in. Also fixed the save feature. Removed the error message displaying under Currency Maintenance drop-down screen. Fixed an issue where Precision CCH holds were getting removed before the task was completed. 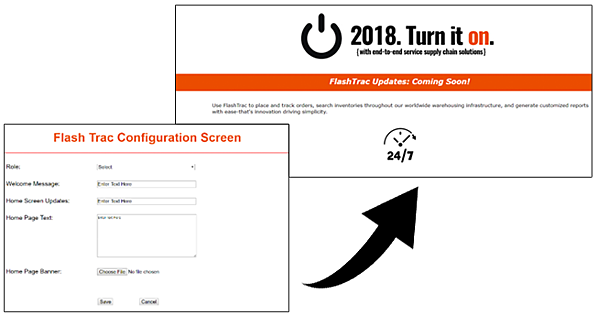 - New Dashboard – Provides real-time updates to inventory personnel regarding MPL file upload status, including instructions on how to fix errors. - Updated Master Parts Template – Includes new columns for transportation and country-specific regulations for parts attributes. Functionality to reassign all exceptions at the master level, including when an exception is changed to IC Analyst Review. This change eliminates redundancy and improves speed to exceptions being reassigned and reworked — improves time to resolution. - Design change and layout. - Functionality to switch between unique part templates without leaving the page. Automated functionality to capture and display amount discrepancies on vendor invoices. Automated functionality to charge per line for Cycle Counts. Functionality to select and add a part to a new order when searching – Streamlines process by eliminating the need to copy-and-paste. 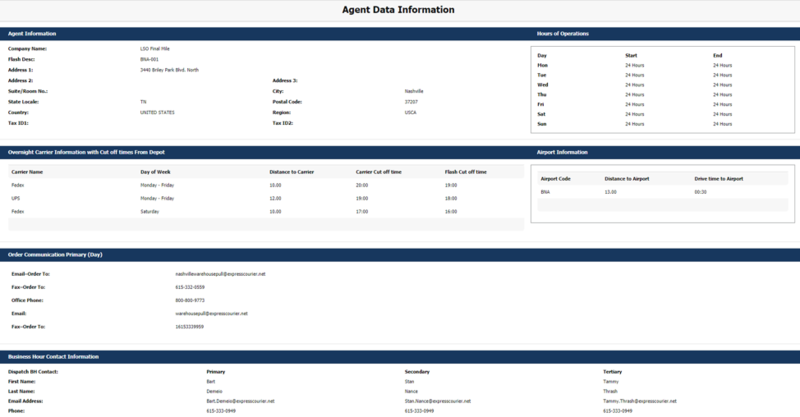 Complete UI (User Interface) overhaul to our Agent Database. Improvements include:Navigation from page to page and consolidation of some pages. - New “Qualified” status – enables reusing an existing agent Flash Description (ie. TES-001). - Enabled functionality to capture true warehouse space vs. occupied or utilized space. - Enabled functionality to define if an agent is eligible for mapping. 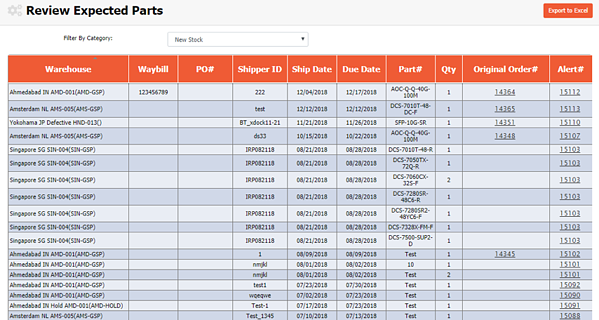 Redesigned Review Expected Parts page to include 3 new columns: PO#, Waybill, and Original Order # – This improves how the warehouses accept material into their locations. Future improvements will focus on expected parts management at each location. All changes below are to have 1 single Order Update screen. Retiring the old update screen eliminates order issues within Precision, our automated export management system. - Moved Notes from under Main Actions dropdown to now directly on the page. - Included a new “General” tab’ which holds all notes excluded from 3rd Party integration and Compliance notes. - Included functionality to enter manual notes based on note type. Included 3rd party carrier integration (UPS, DHL, FedEx only) transit time alongside shipping details. Updated and removed data to improve the tracking and tracing on our International Shipment Tracking Report. Added functionality to toggle between parts and tech orders, without having to leave the page to search for a specific order. Changed location of tracking info under our POD Actions menu, for quicker access to view 3rd-party integrated courier tracking information. Provided different search parameters to look up a part when adding to an existing order. Enabled Serial Number to be displayed under parts section without having to click on the expand function to review serial information for each part. - Sneak peek to the final destination order details before it’s generated. A toggle feature that redirects you to the second leg order once it’s an active order. 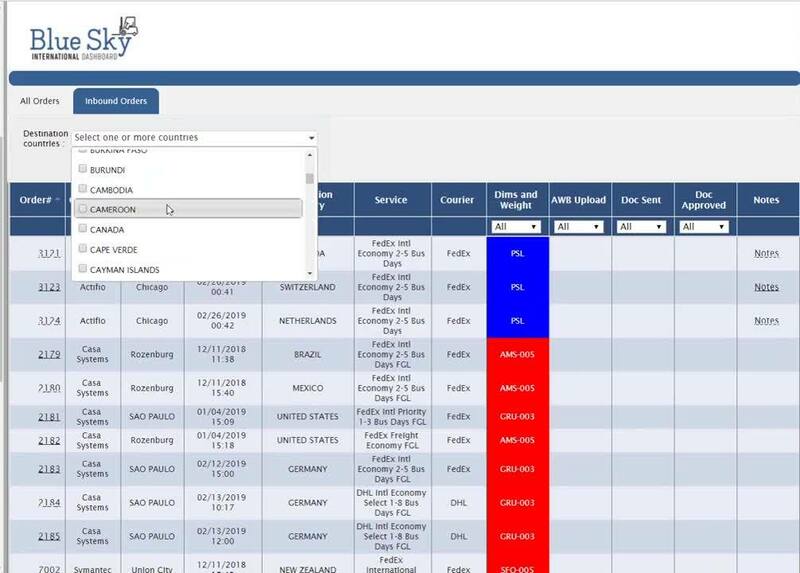 - Improved grid alignment and readability of the Order Reference Changed History screen within orders – Enhances ability to manage and track changes made to orders more efficiently. Improved the grid alignment and readability of our reference change history screen within orders to be able to manage more efficiently and track changes made to orders. Added functionality to see parts on cancelled orders. 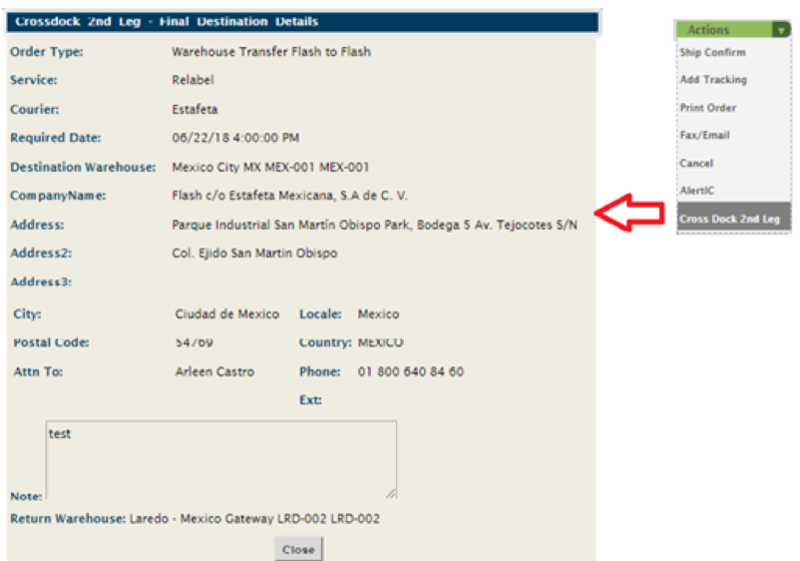 Included FSL Code for Warehouse Transfer orders when viewing on the Order Search and Update screen. Fixed when saving reference details on order create to hold data and not remove when moving to next step of order creation process. Fixed ‘Null’ pop-up message when reference History is selected via Order History. 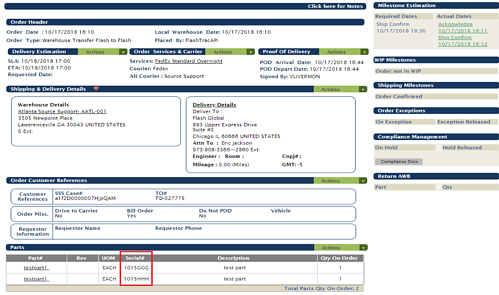 - Fixed Shipment Notes to only display 3rd party courier information. - Fixed date format, which was throwing off sort functionality. Fixed responsibility field on exception resolution screen (Flash or Customer). Fixed duplicate note entries under additional notes within the Exception Resolution screen. Corrected functionality to attach files to exceptions, which currently wasn’t keeping the attachments when uploaded. Fixed within Add/Edit Customer Order Type configuration screen to allow apostrophes in order type naming convention (apostrophes had been causing errors). Fixed 3rd party courier integration (UPS, DHL, FedEx). 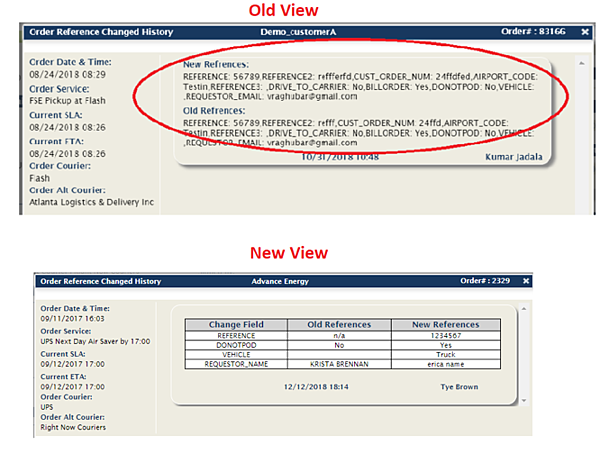 Fixed the ability for Case ID to carry throughout the life of an order when order type Exchange from Customer is used in new order entry. Fixed/Enabled the ability to delete duplicate message mappings (which wasn’t working on Chrome). Fixed duplication of Warehouse Data templates. Removed inactive Receiving codes; now only active codes are displayed. Fixed previous search results from being displayed once a search has been cleared using advanced search through Order Update screen. Fixed same category value in Review Expected Parts page, which was throwing an error. 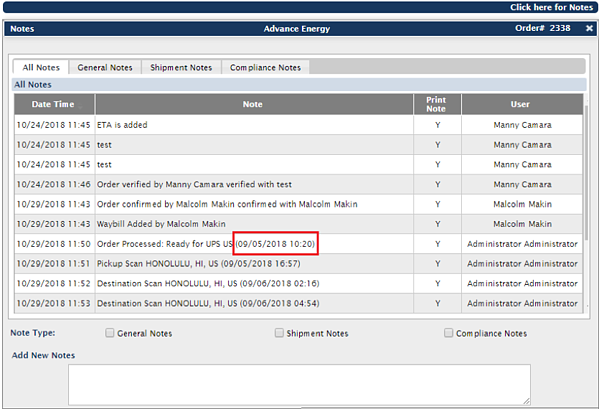 Fixed hold functionality on non-Precision customers, which was causing a pack and hold document to be sent to the warehouses for domestic shipments where all exceptions and holds were cleared. Added Max character limit feature to Warehouse Data Screen to fix errors that were occurring due to additional character limit. In the near future all screens with data fields will have this feature included. Pricing - Manual Orders will be registered to a different GL Code, this will enable the ability to report and perform cost analysis to past and future revenue. - Added additional part search criteria options within in the Order Update Screen when the requirement is to add parts to an existing order. - Fixed domestic address validation which were throwing errors preventing users to create customer orders. - Enabled the ability to switch between Part and Tech orders removing steps to come out of either order to physically search wasting valuable time assist you the customer. Removed unused fields “Customer Expected Resolution Date and Time.” Also, aligned Table and Grid Alignment of Notes to improve readability. Fixed the Responsibility Owner, based on exception type selected, preventing errors related to assigning responsibility of exceptions created by customers or Flash employees. Added New IC status field, called “IC Analyst Review.” This will improve overall exception process to identify who is actually working on the exception. Improved layout of Master and Individual Template Configuration, and included necessary flags to correlate with new MPL Upload tool. Included Transaction History on Master Template Configuration screen. Included service metric to capture kilograms and kilometers (instead of pounds and miles) for international shipments, to ensure customer invoices display the appropriate measurements. RPL/DPL (Restricted Parties List / Denied Parties List) moved from Pack Complete to Order Open (Orders Originating from Union City Location Only!) The change will immediately remove the delay of orders missing SLAs and improve customer satisfaction. Fixed pop-up box appearing with no address history within the Order Update screen. Fixed error message when warehouses are pending approval. Fixed exception reassignment button not capturing attachments during exception creation. Removed blank entries from warehouse selection when creating exception alerts. Fixed Date Sort from Year/Month/Day to Month/Day/Year on Exception Tracking screen. Fixed misspellings on the Order Info Detail page. Fixed the ability to select multiple alerts at one time. Fixed the region from disappearing when creating customer invoices. Fixed the auto-uncheck if individual warehouses are unchecked and removed blank entries next to checkboxes on the Cycle Count screen. IC Control Tower filter fix for Cycle Counts. This will eliminate Cycle counts being missed for active warehouses. - Improved screen layout of the Packing Audit screen which required moving some buttons around for easier navigation.